Tiger Woods Withdraws After Nine Holes At Players Championship : The Two-Way His bid to once again be the world's best golfer suffered another setback. Limping and appearing to be in pain, he was six-over-par after just nine holes. 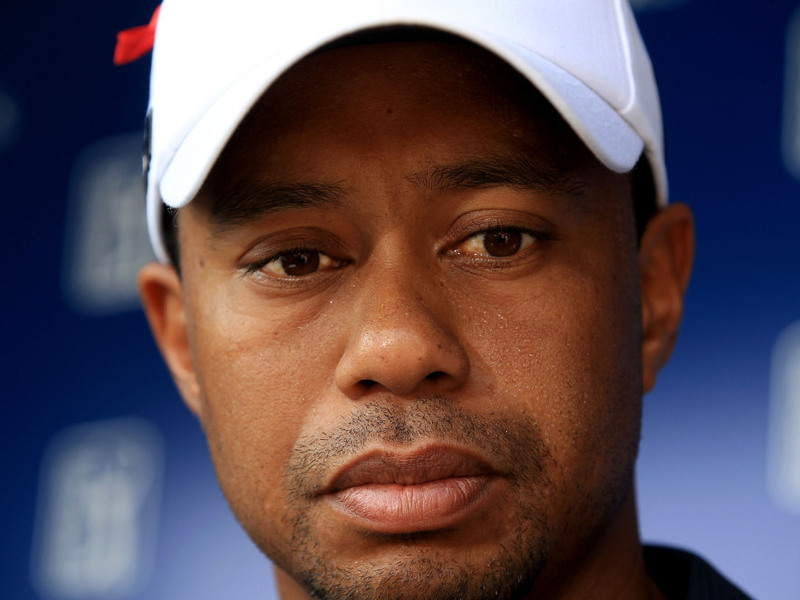 Tiger Woods talked with reporters after withdrawing from The Players Championship this morning. Tiger Woods' bid to once again be the world's best golfer suffered another setback today. He walked off the course after nine holes at The Players Championship in Ponte Vedra Beach, Fla., this morning. USA Today's GameOn! blog writes that Woods was 6-over-par at the time and was visibly limping — he hurt his left knee (which has had four operations) and his left Achilles during the Masters Tournament last month. He told reporters, according to The Associated Press, that "I'm having a hard time walking." Woods hasn't won on the tour since his personal life and (later) word of his extramarital affairs exploded on to front pages and websites in November 2009. As Eyder reported Monday, Woods is now ranked No. 8 in the world.